Pinja started gymnastics in 1998. After 5 years of basic gymnastics and 6 years of aesthetic group gymnastics she wanted to try something new. She joined the Sorin Sirkus youth circus in 2009. At first she tried many disciplines but soon she noticed that aerials, contortion and handstands were her thing. Pinja was part of the Sorin Sirkus performing group in 2009-2011. In 2000 Milla started in a youth circus called Sorin Sirkus in Tampere in Finland. During the first years she practised many different disciplines. Later she got more interested in aerials, contortion and handstands. In 2006-2011 Milla was part of the performing group of Sorin Sirkus that participates in the annual Christmas shows and performs in other events in Finland and abroad. In 2010 we realized that training alone wasn't interesting enough. We started to try tricks togerher and since then we have stayed on that path. We performed aerial hoop and duo contortion in the Sorin Sirkus Christmas shows in 2010-2011. We participated in Finland's got Talent in 2012 and we got in to the finals. After that we have been performing around Finland and abroad. Making our dreams come true! On 2013 we started to work with UniFlow. We started to learn new skills in fire spinning and combining them to dancing. Since then we have been also a part of an amazing and talented fire group. 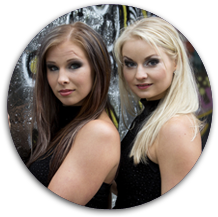 We have been performing with them in many different kind of shows, productions and events around the world and in Finland. Lumina Productions creates amazing shows combining fire, acrobatics and music.